Why buy a king headboard when you can DIY it? 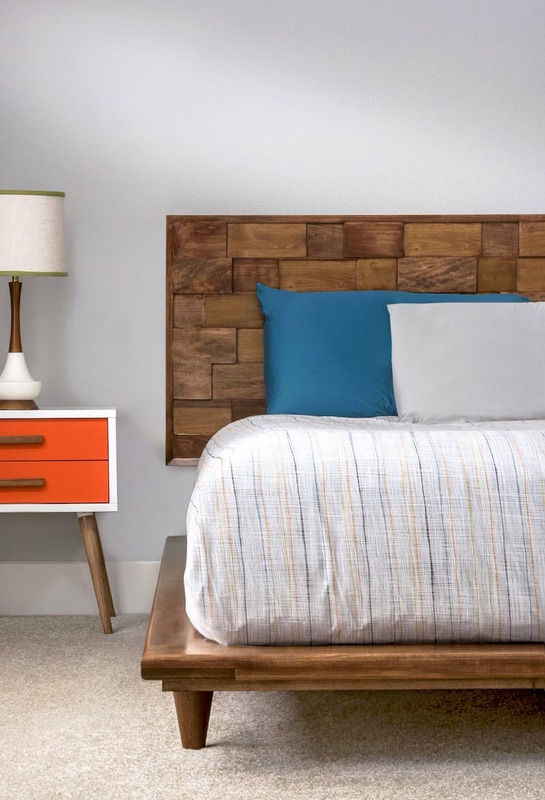 Build this mid-century modern DIY headboard using our easy-to-follow tutorial. Do it cheaper, better (higher quality), and make it any color you like. Skills Required: Intermediate. You have to be able to use a miter saw, table saw, sander, drill, planer, and possibly a router. 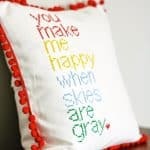 You’ll be doing some gluing and screwing and lots of measuring. This is not a hard project, but it can take time, especially given the clean lines that a DIY wood headboard demands! If you saw our DIY platform bed frame, you might be wondering how to make a headboard that goes with it. Well today is your lucky day – this is the tutorial! This king headboard can obviously be modified to any size. We’ll leave that up to you. 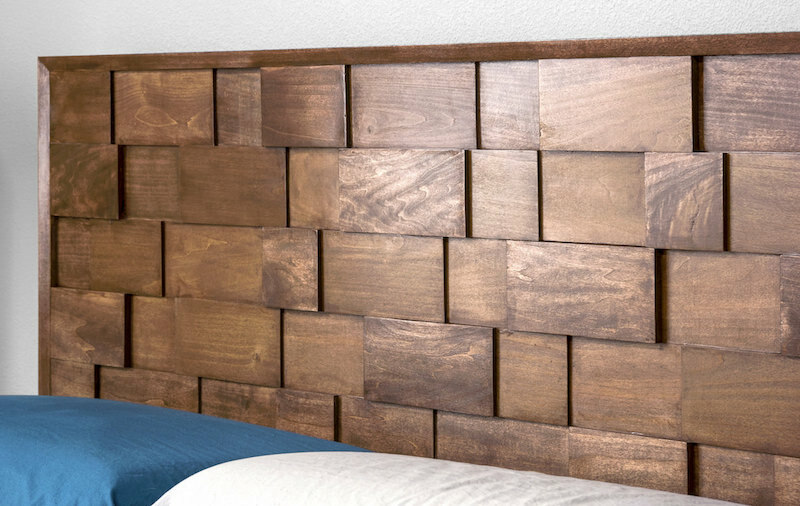 Our inspiration for this DIY wood headboard was mid-century modern design. We love original pieces like this one that are made with various sizes and layers of awesome teak. 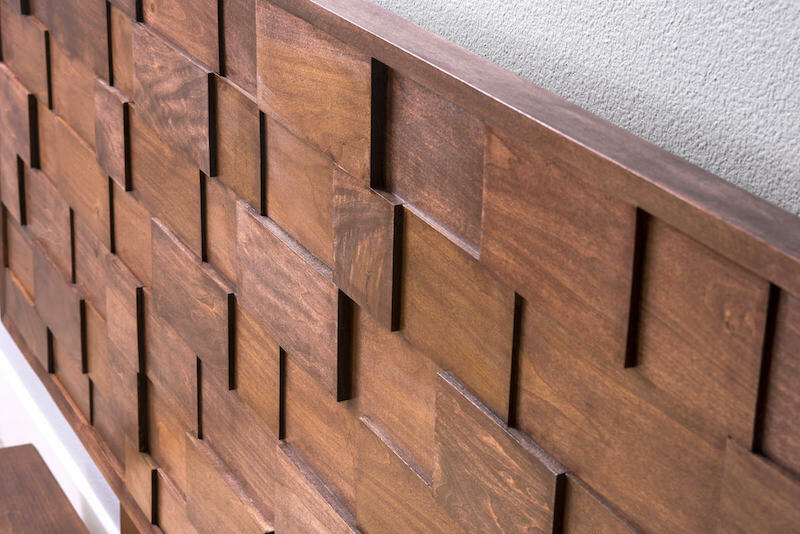 While we didn’t use teak for this project, we did use the mid-century modern era for our king headboard inspiration. The different layers and thicknesses of wood give this project a really unique look. *if you are a newbie woodworker, remember that wood sizes are given as the cut from a log. For example, a 2″ x 4″ is cut that size, from a rough log but then it dries smaller (around 1.5″ x 3.5″). So your EXACT measurements may vary, though they will be close. We purchased poplar for our king headboard from Home Depot, which is also where we got our Ryobi Tools. We wanted a hard wood that was easy to work with, and we like the grain. Our cost for this DIY wood headboard was about $200, but you could reduce the cost by using a less expensive wood. 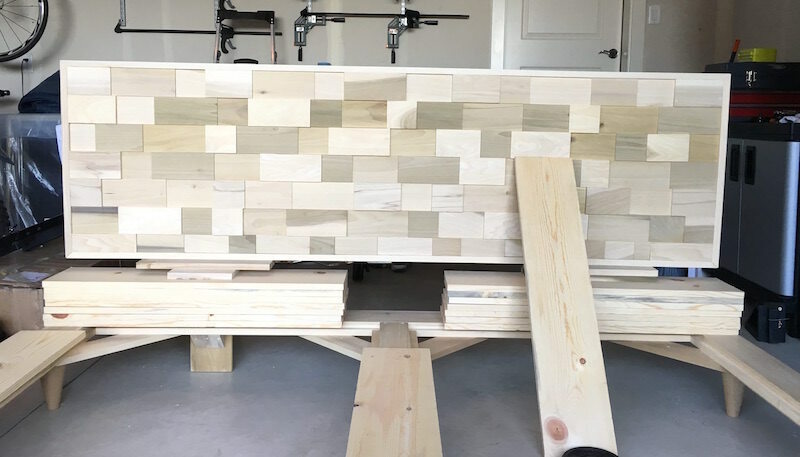 Just to give you a preview of how this DIY wood headboard comes together, you’ll start by making support pieces for the bed, which you might have to alter a bit if you are attaching this DIY headboard to something different. Then you’ll make a frame out of popular, and cut plywood that you’ll glue within the frame as your backer. That all gets glued together and then wood pieces are cut and glued to make your mosaic on the front. Let’s jump right into this DIY wood headboard tutorial! 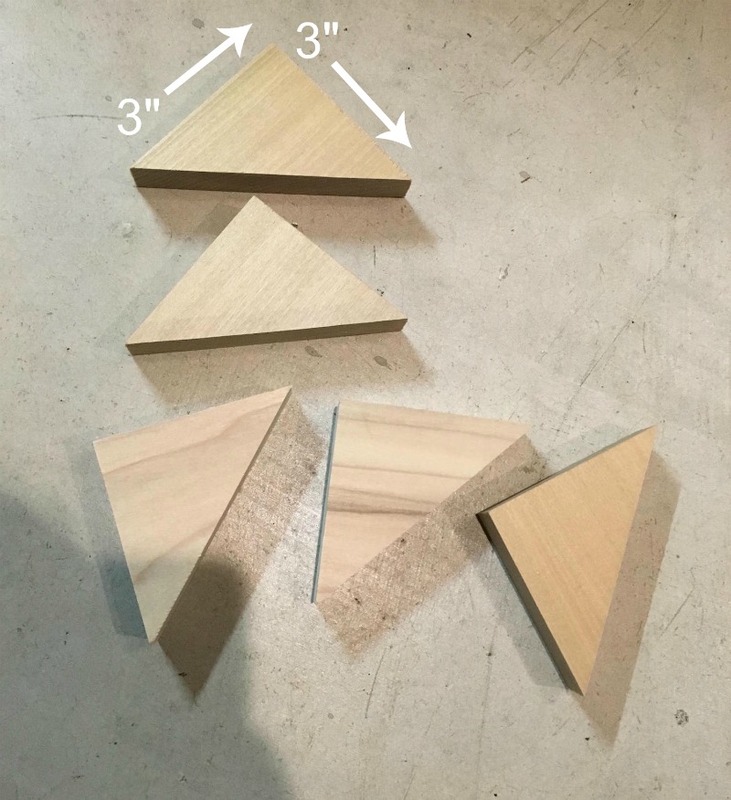 Step 1: These triangle pieces were left over from the corner braces of our platform bed. If you completed that project, you might have ten (10) of these triangles, which is what you need. If you didn’t complete that project, you’ll want to fashion mounting pieces using this method or a similar method IF your bed frame requires them. 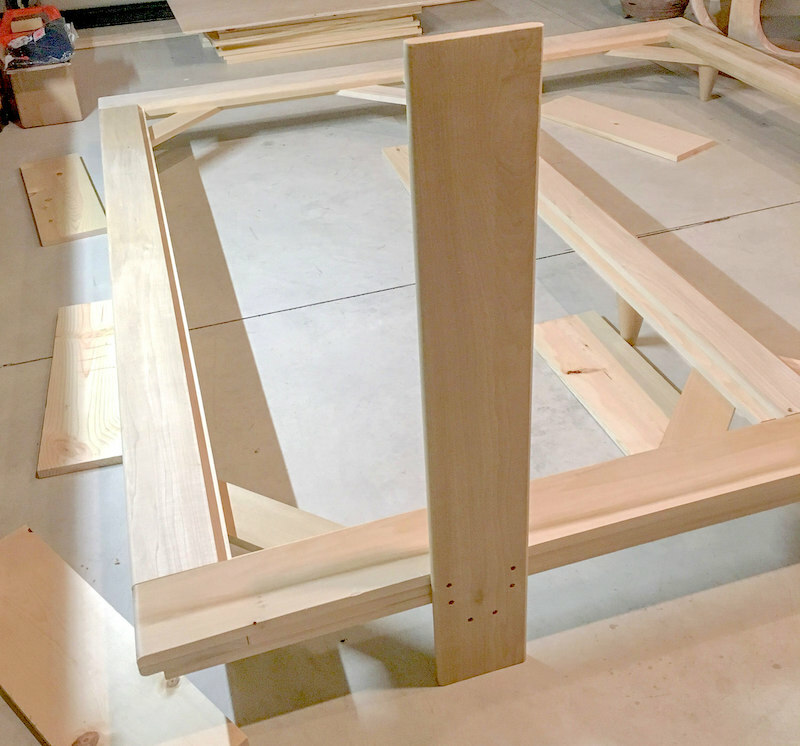 The way you attach your DIY headboard might differ if you didn’t build the same platform bed, so read through the entire tutorial before making any support pieces. These were cut (using a miter saw) from a 1″ x 4″ x 8′ board – they have 3″ sides and were all cut a 45º angle. Step 2: Glue five (5) triangles together to make one support piece, then repeat to make two. Sand the mounting pieces smooth and trim the ends off square. Step 3: Mount these support pieces on the underside of the head rail of the bed frame. 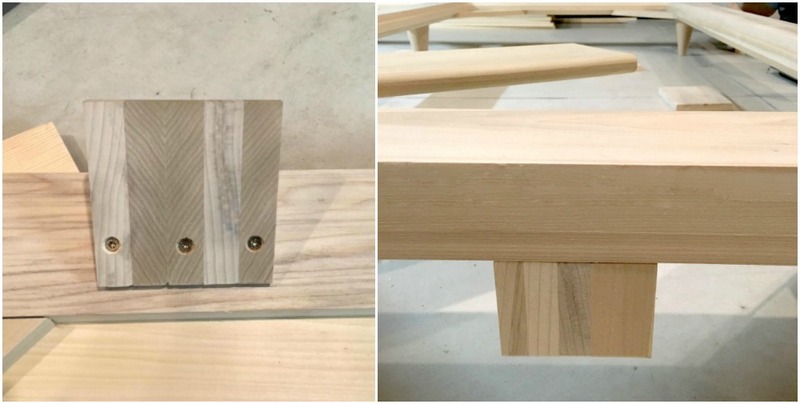 The outside edge of each support piece should be 15″ from the outside of the frame. Using (3) screws to mount each piece to the underside of the head rail as shown. Step 4: Cut one piece of 1”x 6” x 8′ wood to two (2) 37″ lengths. These will be your headboard mounting boards. Using a round-over router bit, round over the top and bottom edges of the headboard mounting pieces. You don’t HAVE to do the rounding over, but we just though it looked nice so we took the extra step. 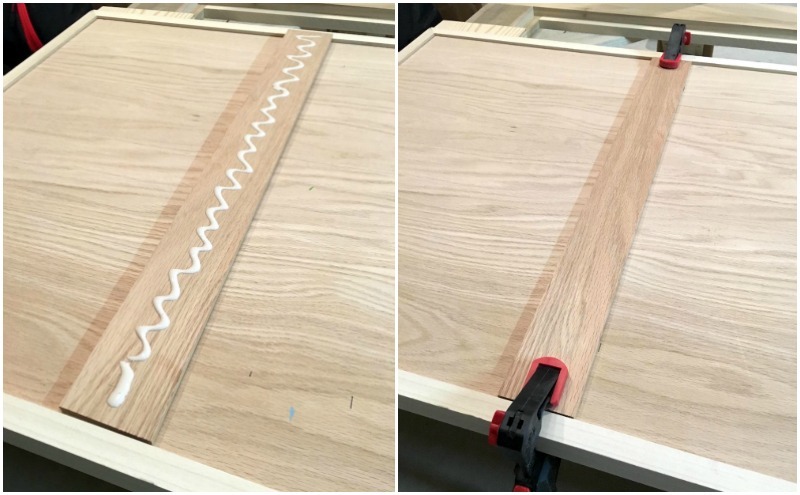 Note: You likely do not need to cut the board width for most of the cuts in this tutorial – just the board length. The boards will probably have dried to about 5 1/2″ wide (but check). Use a table saw to cut the width if you need to. Step 5: Using six (6) screws on each side, mount the headboard boards to the outside edge of the head rail with them touching the ground. Four screws will go into the bed frame and two will go into the supports as shown. Step 6: Cut trim pieces to make the king headboard frame. You’ll use a miter saw and cut two (2) 1″ x 2″ x 8′ boards into 1″ x 1 1/2″ x 84 3/8″ length pieces. Then cut one (1) 1″ x 2″ x 8″ board into two (2) 1″ x 1/2″ x 25 1/4″ pieces. 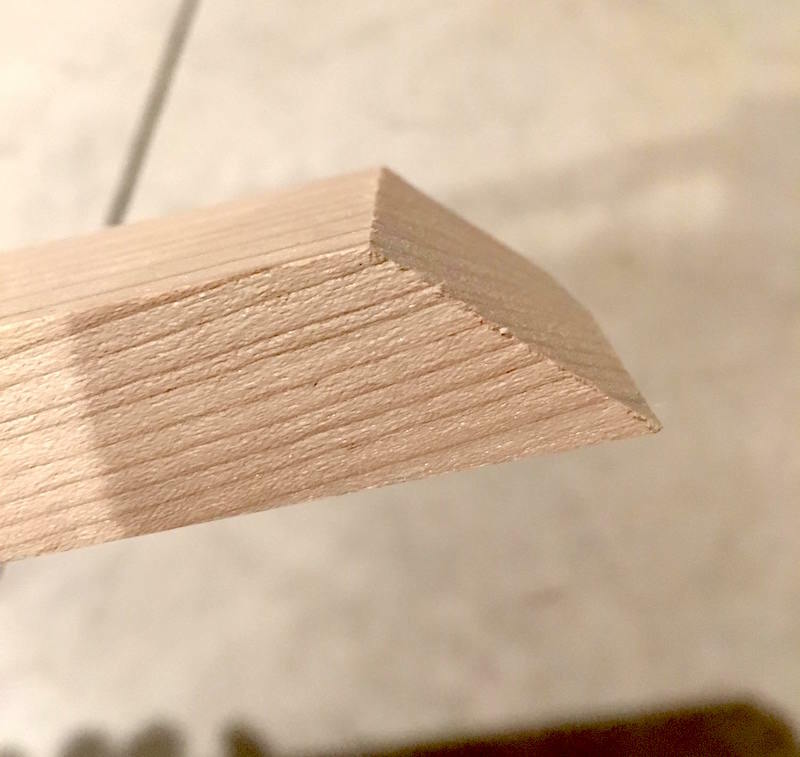 Using the miter saw, cut an inward-leaning 45º angle cut on each end of each 1″ x 2″ – so you’ll be making eight cuts total. Step 7: Using a table saw, angle the blade to 15 degrees. 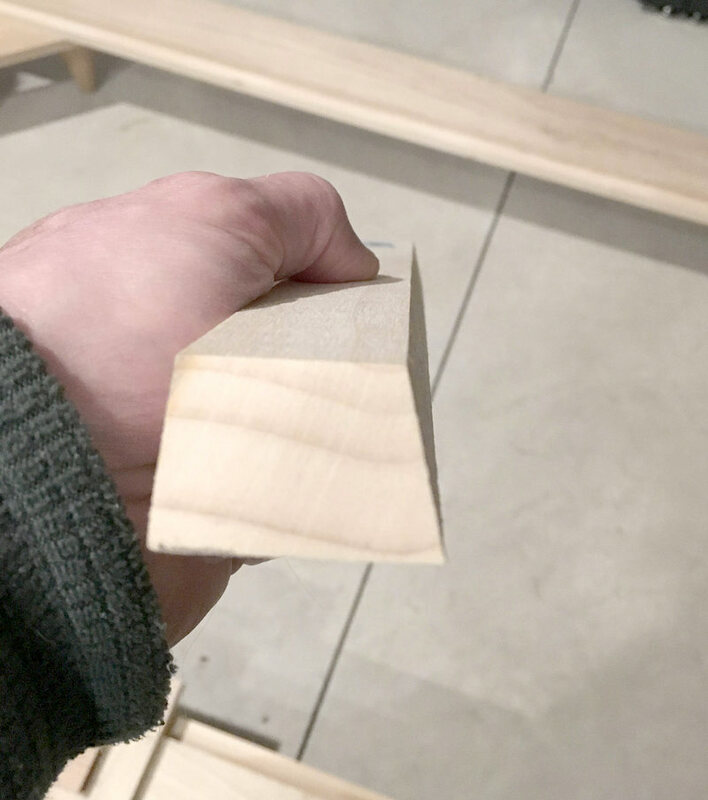 do a 15º bevel cut all the way down the length of one edge of each of the frame pieces. Step 8: Reset the table saw from Step 7. Set the blade to a ¼” cutting depth and move the gate ¼” away from the blade. Flip the frame pieces over and cut a ¼” deep groove the length of each frame piece. NOTE: this groove needs to be cut on the OPPOSITE side from the bevel cut – see the picture above. You want the groove to be on the flat side of the wood. Move the gate ⅛” (or a blade’s width) further from the blade and cut another groove. This should make one ¼” inch groove (that you see in the picture). Step 9: Take two (2) pieces of ¼” thick x 2’ x 4’ oak plywood and, using a table saw, cut both pieces of plywood to a 41 ⅜” x 23 ¾” size. These will be the back of your DIY wood headboard. Step 10: You might need help with this step since this is a king headboard! Take both pieces of cut plywood and slide them end to end down into the groove of one of the 1″ x 2″ x 84 3/8″ pieces. As you can imagine, you’re going to fit all the pieces together and then add some glue. 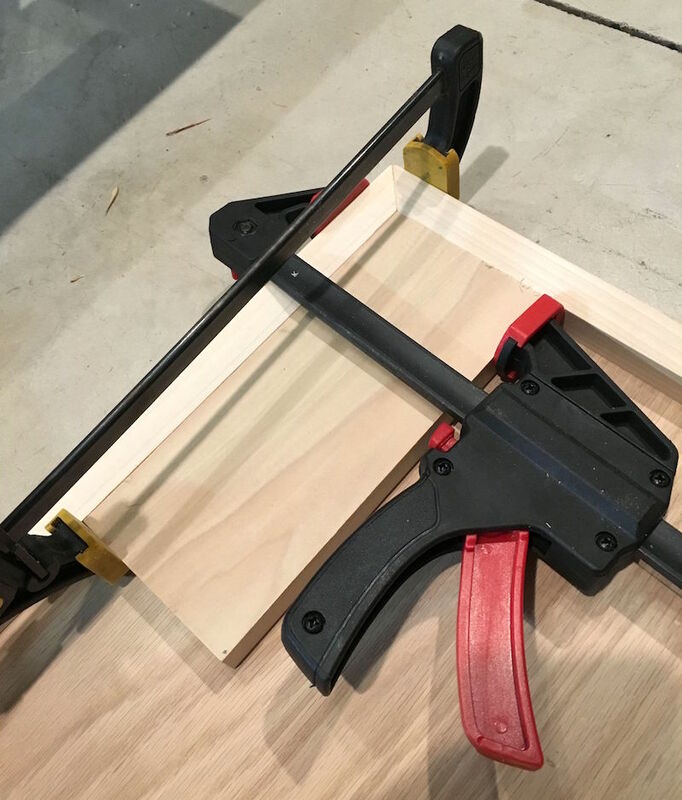 You’ll want to add some clamps, too. 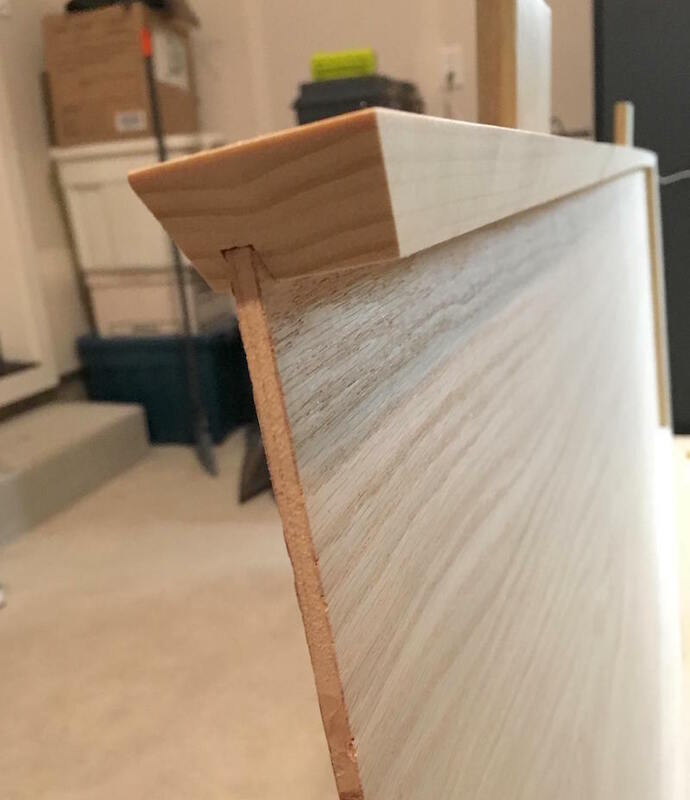 You can see how we glued the corners of our DIY headboard using a piece of scrap wood above. Do this on all four corners and you’ll be good to go for this step! Step 11: After the glue has set up, the headboard frame should look like this. 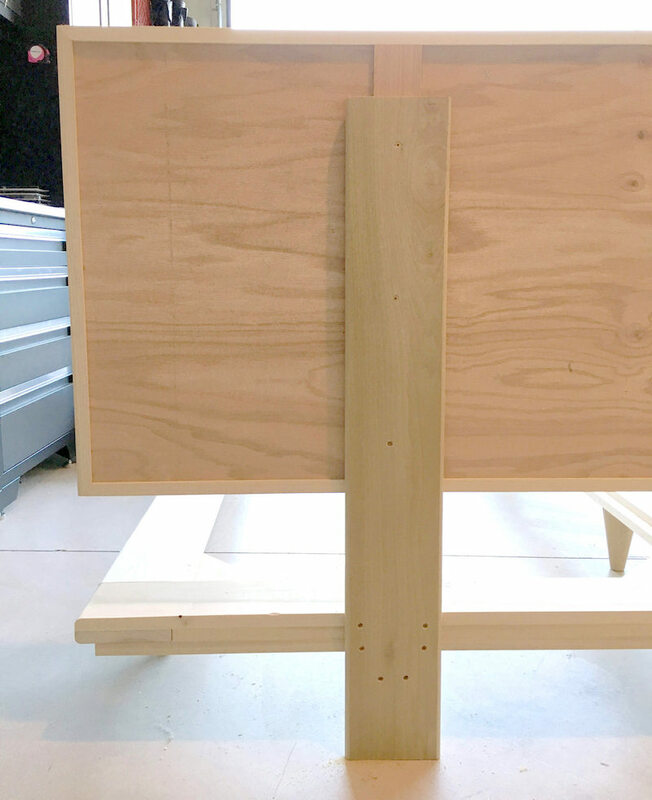 The corners are only tacked in place at this point and you will be glueing in cut block pieces to reinforce the DIY wood headboard frame and create your main design. The inside dimension of the DIY headboard (inside the frame) should be approximately 23 ½” x 82 ¾”. 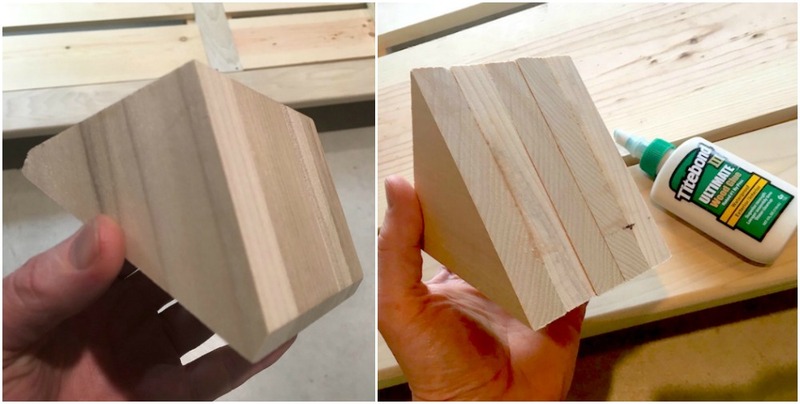 It’s fine if it’s not exact – you can make the blocks fit just fine. Step 12: This is the fun part of this DIY wood headboard! You’re going to create the wood mosaic on top of the plywood. First, determine how many horizontal rows you want in your mosaic. We used six rows, and we recommend picking a number of rows that is divisible by 3 (ie. 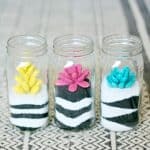 6, 9, 12) as you are going to be using three thicknesses of wood to create your mosaic. 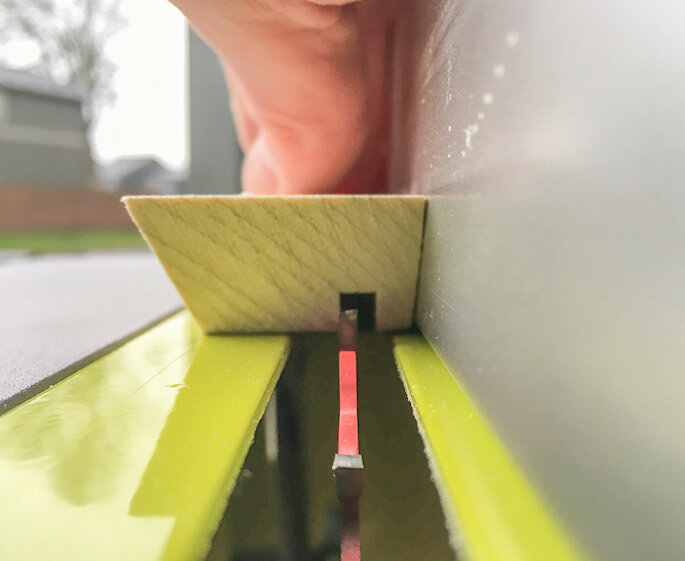 Step 13: Using a planer, you are going to create three thicknesses of wood boards, so you’ll have two boards of each thickness (if you do it the same way we did it). 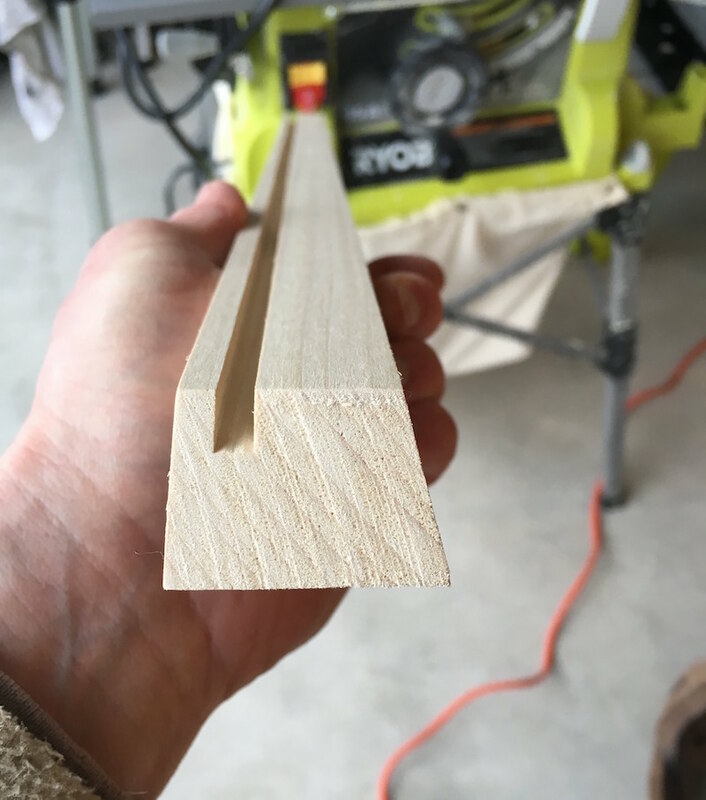 Keep one board at 3/4″ thick. Run two boards through the planer and remove 3/16″. Run those same board through the second time. Then pick two additional boards and run them through, removing 3/16″. You’ll then have six boards of three varying thicknesses. Step 14: You’ll know how wide your wood needs to be by taking the vertical measurement (top to bottom) of the headboard. For example, the inner area of our king headboard is 23 1/2” x 82 3/4”. So each board needs to be about 3 7/8″ inches wide (23 1/2″ divided by six rows). Use a table saw to cut the boards to the width you like, if you need to. We didn’t need to trim much at all. Step 15: Using a miter saw to cut each board into lengths of 2”, 4”, and 6”. Try and cut an equal amount of each length from each board as you are going to make a random mosaic. 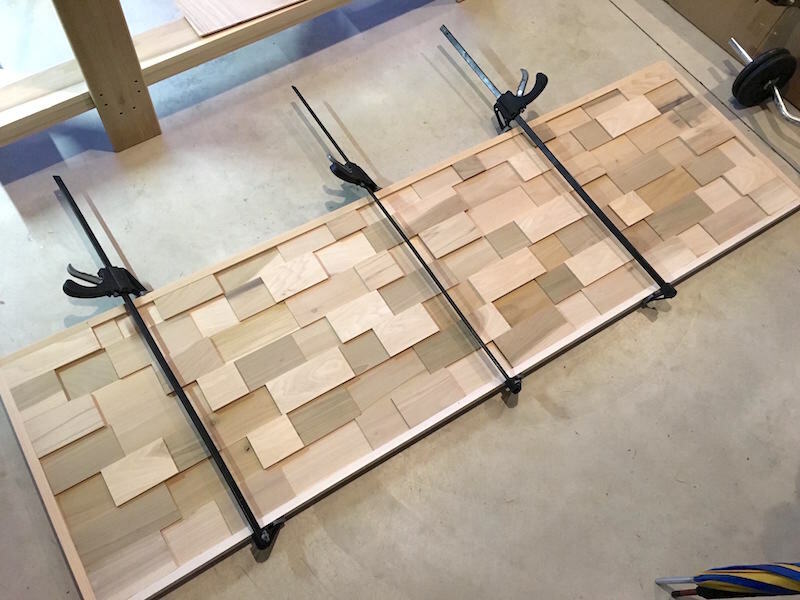 Step 16: Take your mosaic wood pieces and lay them out in the headboard frame to make sure you get a nice mosaic pattern using the different thicknesses and lengths. When you get the pattern the way you like it, glue all the pieces in place and clamp the frame. Try really hard not to get any excess glue on the surface of the wood if you are staining as it acts as a resist (so wipe it up immediately). Let dry overnight. Note: Don’t get frustrated if your wood doesn’t fit. Do your rows, and then do your adjusting (cutting) on the final row. If it’s just a little bit of width here and there, no one is going to notice. Step 17: Cut three 2 ½” x ¼” x 24” pieces of finished oak down by 1/2″ inches on one end to 2 ½” x ¼” x 23 ½”. 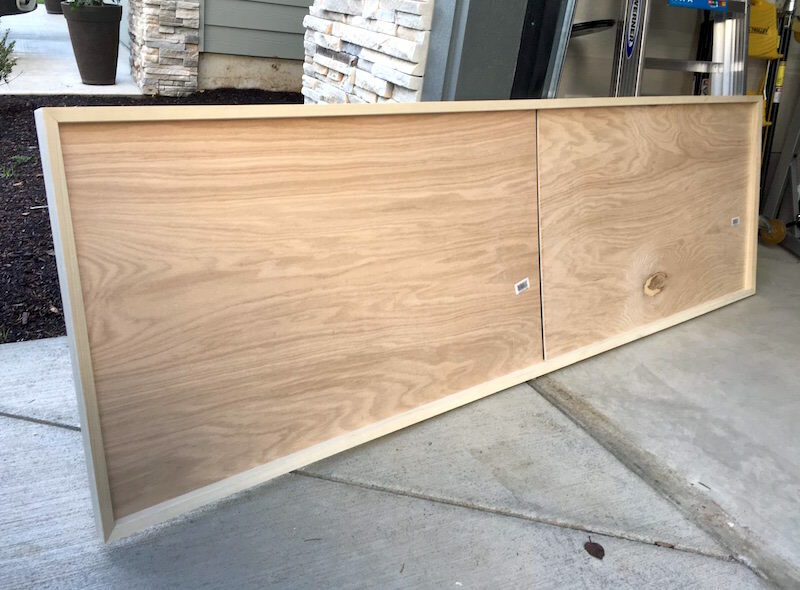 Flip the king headboard over and measure 18″ from each end. Glue the pieces of oak in place at those points. Then place your third piece of oak in the middle and glue. Clamp everything as shown above. Now you’re going to mount the headboard. I decided to mount it 7” above the bed frame. I raised it up on some wood to hold it in place for mounting. 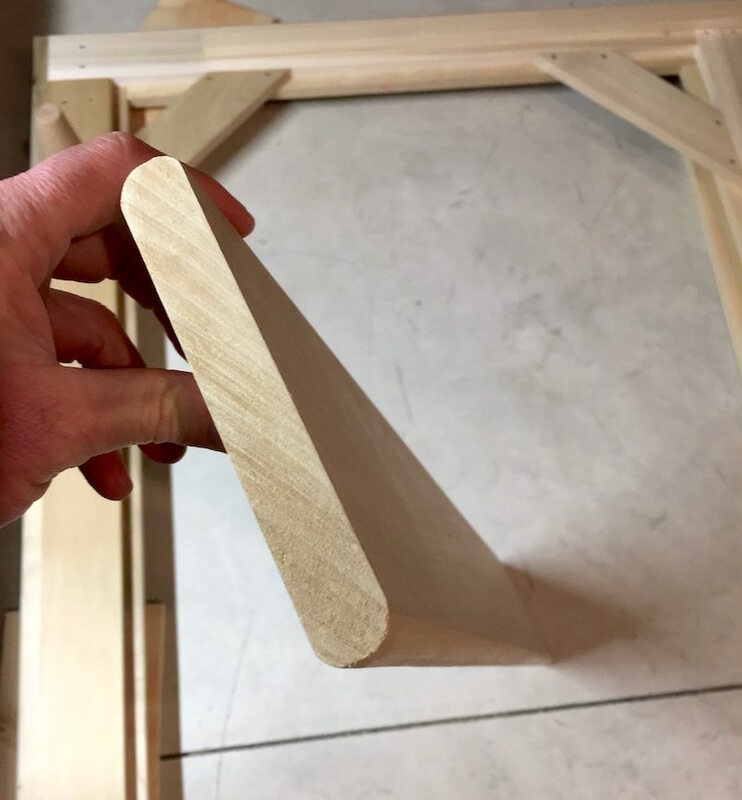 The headboard pieces that you mounted to the bed frame (if you did this step) should match up to the oak support pieces on the back of your DIY headboard. 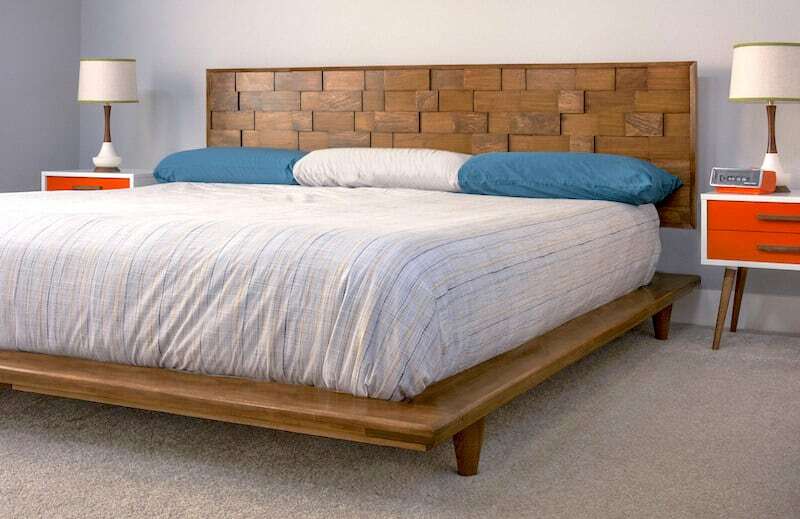 When you get the DIY headboard into place, use 1 ½” wood screws to mount the headboard to the bed frame. You might need assistance for this step – someone to hold up the headboard so that it’s even while you screw it in. Step 18: Now’s the time to decide whether you are going to stain or paint your DIY headboard! We used Minwax waterbase stain (a custom color to match the existing furniture). Then we coated with a Minwax waterbase polycrylic and let dry for 24 hours. Important Note: stain will not stick to any areas of the headboard where you have left glue to dry. Try to sand away any areas like this if you are staining. If you happen upon these areas WHILE you are staining, let the stain dry, sand away the area and blend in. Now you know how to make a headboard and I’m wondering – would you try it? Let me know in the comments! Oh my gosh I love this headboard and your bed platform. It gives a nod to mid-century modern but still has a contemporary flare.